Competitive strategy forms the basis of how marketers position their products and brands in the marketplace. Those of you who are familiar with brands like Nordstrom’s, Disney and Wal-Mart would also recognize their respective marketing messages, namely: Service Leadership, Quality Leadership and Cost Leadership. 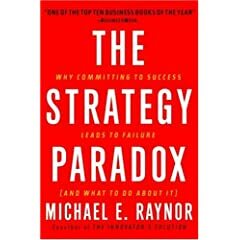 In the book “The Strategy Paradox”, Michael Raynor challenges these long standing approaches to strategy. His analysis shows that the companies that adopt these strategies (perhaps inadvertently) expose themselves to extraordinary risk in the face of universal uncertainty. While there are many more ventures that fail, the companies that do succeed not only attain a dominant position amongst investors and consumers but also become the basis of what defines successful strategies. Unfortunately, these decision making processes do not clearly take into account the risks taken by these firms. To illustrate his point, the author asserts that in order to connect with customers, the firm has to capture its value through a strategy that is challenging for competitors to imitate. This “must commit” mentality forces the firm to leverage its assets and capabilities towards this end. While this approach results in capabilities that are difficult for competitors to imitate, it forces the firm to commit to capabilities in the face of uncertainty. He further observes that the longer the time horizon of the commitment, the greater the degree of uncertainty faced. If the commitments happen to be the wrong commitments, it is often non-trivial to make corrections and may result in lost opportunity or outright failure. It is this impetus to commit in the face of uncertainty that exposes the firm to risk. He calls this “The Strategy Paradox”. In his book, Michael Raynor takes a risk adjusted approach to strategy versus the survivorship bias that currently permeates business analysis and literature. The author builds his case by combining historical data with specific cases to craft his message that failures are not just a clear cut case of bad strategy but usually “great strategy coupled with bad luck”. One such case is the infamous VHS versus Betamax format wars between Sony and Matsushita. In this example, he shows how most analysis of Sony’s failure and Matsushita’s complete dominance is largely polluted by hindsight. Attempts to determine best practices based on this approach is therefore inherently flawed in that it does not really provide today’s manager the tools to make decisions in the face for market uncertainly (which is something we wrestle with everyday). In this case, Sony managers naturally utilized existing core competencies and capabilities that it had used in developing highly successful products such as the Sony Walkman to the video standard battle. Michael Raynor demonstrates that Sony carried out detailed analysis of the situation and made sound decisions at each step of the way. It was therefore not the lack of attention or execution that was the cause of Sony’s ultimate failure. In this case, Michael sites Sony’s commitment to video quality over VHS’s longer recording time was a key difference between the competing standards. Both Sony and Matsushita made this decision in the face of market uncertainty and not because they possessed any special information or magic crystal ball. Sony’s decision was of course rooted in the very core value (quality) that had made it a success story. When it ultimately became evident which way the market was leaning, a series of missteps by Sony to re-position its product sealed Betamax’s fate to that which we know of today. Regardless of whether you agree with Michael’s assertions, his book is incredibly thought provoking and an excellent addition to any strategic manager’s business book collection.